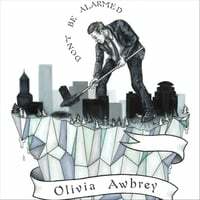 Psych-rock meets riot grrrl meets a folk-singer protest song: Portland, Oregon's Olivia Awbrey writes songs with wit, passion, and a heavy dose of reality. Since releasing her debut studio EP, Fight or Fight (2017), Olivia Awbrey has made a home for herself in the folk-punk and psych-rock communities in the Pacific Northwest and England. Unafraid to blur lines between folk, psych and punk, her style has most recently been likened to Esme Patterson, Liz Phair and Courtney Barnett. Awbrey and her band took her songs on the road throughout the West Coast and to FAI 2017, FAR-West 2017, and the Spokane Folk Festival last year. Before setting out as a solo artist, Awbrey played guitar in the Eugene-based folk-rock band Small Joys from 2011-2014. The band achieved local success and they released their debut album on the night of their final show as a band. In 2015 Awbrey began touring the US as a solo artist, honing her sound, and in 2016 she moved home to Portland, gathered some friends, and recorded her debut studio EP. Whether she is singing about earthquakes, border patrol, survivor recovery, or hit 90s movies like Thelma & Louise, Awbrey has a way of framing the world with a voice that is distinctly her own: with wit, passion, and a heavy dose of reality. Awbrey is also an outspoken advocate for women's rights, survivors of sexual assault and people with disabilities. She continues to work with various groups in Oregon to expand healthy relationship education for adults with disabilities. While intermittently recording her sophomore release with producer Hutch Harris (The Thermals), due out 2019, she is on tour in the US this spring and summer and the UK this September.